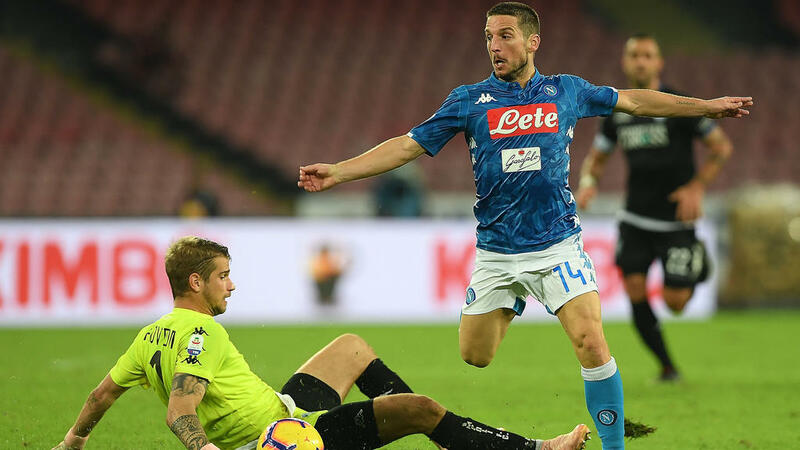 Dries Mertens scored a hat-trick as Napoli warmed up for next week's crucial Champions League game against Paris Saint-Germain with a 5-1 thrashing of Empoli to go back to second place in Serie A and put the pressure on champions Juventus. "We were just deadly in attack," said coach Carlo Ancelotti as Napoli closed the gap on Juventus to three points before the leaders host Cagliari on Saturday. Lorenzo Insigne opened after nine minutes in the San Paolo Stadium with Belgian Mertens also scoring in the first half. Mertens added two more after the break in the 64th minute and in stoppage time with Poland's Arkadiusz Milik also getting on the scoresheet in the last minute. It got Ancelotti's side back winning after consecutive draws against Paris Saint-Germain (2-2) and AS Roma (1-1). But the former Chelsea and Real Madrid boss said he was "more angry than excited by the result". "The result says that we played a great game, but Empoli played better than us. "We had great difficulty until the 4-1 goal. We played well against Roma, but we drew, and tonight we won with a big score. "I even got angry with Mertens. He was playing as a winger and I shouted at him that if he wanted to score goals, he had to go more central. "He replied that assists were important too. He got a hat-trick in the end and an assist too." Ancelotti rotated his squad ahead of Wednesday's game against the French champions, bringing in defender Kevin Malcuit and young midfielders Amadou Diawara and Marko Rog, but he stuck with the trusted forward attack of Insigne and Mertens. Insigne got the first after nine minutes after good work by Kalidou Koulibaly with the Senegalese defender breaking through from his own half. Luca Antonelli thought he had scored the equaliser for Empoli on 15 minutes but the goal was ruled offside. Insigne then intercepted a reckless Giovanni Di Lorenzo back-pass to set up Mertens, who slotted in a low drive from a distance on 38 minutes. Francesco Caputo gave Empoli hope when he beat the offside trap with a diagonal shot after 58 minutes, but six minutes later Mertens got his second. Insigne and Mertens were instrumental in Milik's fourth on 90 minutes, with Insigne then setting up Mertens for his 75th Serie A goal deep into injury time, and 98th in total for Napoli. "I've never had such a large and balanced squad before, so I can chop and change the line-up without that much difference in quality," said Ancelotti. "But the truth is that Insigne and Mertens are a difficult pair to leave out. "There is a lot of competition, we'll have to think carefully about the choices for PSG. "Mertens is in spectacular form at the moment, but Milik played 10 minutes and scored a goal, so he's doing well too." Empoli remain winless since the opening match of the season back in August against Cagliari.